The Artoklasia is a service held at the end of Vespers or at the end of Orthros, or even at the end of the Liturgy. Five round loaves of bread are offered by individual faithful as a sign of devotion for personal or family anniversaries such as name days and other occasions bearing close connection with the experience of the Orthodox. The five loaves are reminiscent of the five loaves that Jesus Christ blessed in the desert and by which five thousand of His hearers were fed. Artoklasia also symbolises and brings into practice the Agape meals of the very early Christian communities. Then, after the faithful received the Body and Blood of Christ, they would gather in a common meal, thus signifying the brotherly association established between them by their common faith and by their receiving the same sacramental Lord. Also, the Agape meals served a charitable purpose by providing meals to the poorer from among them. The significance behind the Orthodox artoklasia includes also the fact that, among the Orthodox, bread continues to be highly valued not only as a basic food but also as the supreme symbol of the Body of Christ - for it is the bread which is changed by consecration in the Liturgy into the Body of Christ. 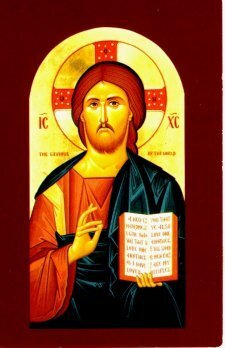 Christ has been repeatedly designated as the Bread of Life, and also as "the Bread which came from heaven". Bread does also symbolise the Church of Christ, which has spread all over as the wheat on the mountains and which was gathered by Christ into one body. Thus, bread has been given a mystical meaning according to which it constitutes the essence of the spiritual life of the Christian. The blessed bread of the Orthodox artoklasia has been from ancient times considered to effect personal sanctification and to help the individual against bodily infirmities and illness "if taken with faith". The Greek term "artoklasia" derives from the very words used by the Evangelists in describing the Last Supper at which Christ "broke bread" and offered it to His disciples as His own Body. Also, "bread is broken" in the Orthodox artoklasia, signifying not only an identity in terms but a far more significant affinity between the Lord's and His Church's breaking of bread.